Three Rooms Press, 9780988400849, 131pp. Taking on the streets. East or Westside. Uptown and Down. The pace quickens through the boroughs from necessity. Every move the most important. Too much competition. Looking at each other for someone to blame. Doing anything just to be part of the magnitude. Everybody lost in the expanse. The City doesn't cheat you. It teaches. You absorb either knowledge or the blows. There are days when you find out you can't cut it anymore. And there are others when you come out at the top. The "Have A NYC" anthology series is an intense annual collection of modern short stories set in New York, edited by Peter Carlaftes and Kat Georges. 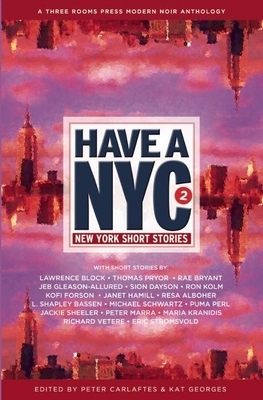 In Have A NYC 2, authors include acclaimed crime writer Lawrence Block (Eight Million Ways to Die, Hit Me), contemporary surrealist writers Rae Bryant and Janet Hamill, and Evergreen Review editor Ron Kolm. Other authors include Jeb Gleason-Allured, Sion Dayson, Kofi Forson, Resa Alboher, L. Shapley Bassen, Michael Schwartz, Puma Perl, Jackie Sheeler, Peter Marra, Maria Kranidis, Richard Vetere and Eric Stromsvold.